I was supposed to do this the proper way, but as with so many things, I ran out of time. So I cheated a little bit, as I often do, and made do with the things available in my fridge. Worked well enough, I think, so why not have a go yourself? 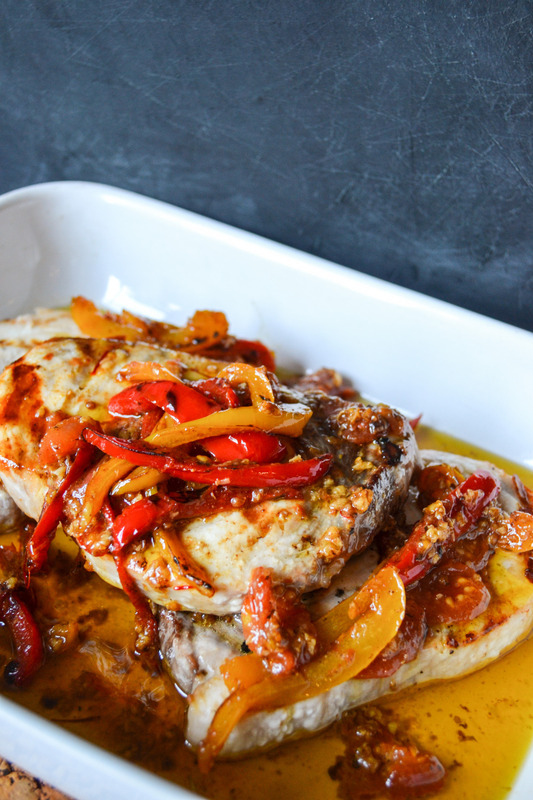 The sauce is oily and light, rich in flavour–the perfect compliment for these thick swordfish steaks. Ask your fishmonger to cut them about an inch thick. You won’t regret it. Boil up some water, and spear the tomatoes on the end of a fork. Stick the tomatoes in the water, for about a minute, until you notice some splitting in the skin. Remove from the water, and use the crack to peel off the skin. Half, and leave to cool. Heat up a pan, with some olive oil. Add the peppers, and keep on low heat, letting them brown and go soft gently. Keep cooking for about twenty minutes or so. In the meantime, place the saffron threads in two tablespoons of warm water in a bowl, and leave to infuse for about five minutes. Add the garlic, chilli, ground coriander, cumin, and tomatoes with the peppers, when the latter are nearly done for their twenty minutes. Gently heat it through, and stir in the 150ml of olive oil. Add the lemon juice and saffron water. Heat up a griddle pan, and brush with oil. Fry your swordfish steaks for about five minutes on each side, for quite a rare fry if they’re thick. It’s okay for it to be quite pink in the middle! If you don’t like that, or the thought of it even, just keep cooking, but try not to overcook–you’ll only end up with a fibrous, dry mess of a swordfish steak. Add the fish to the vegetables, adding the herbs if desired, and letting the oils and vegetables coat the fish. Serve up. Wow this picture looks amazing! Will have to try this. I’m so sorry that I never replied to your comment (I hadn’t realised! ), but thank you for yours — I hope you enjoy/enjoyed it! You have such beautiful colours in your recipes!